Surprise is the most evanescent of all emotions. If it lasts for longer than a second or two, baring psychological shock, there is a significant feigned component present - and unfortunately perhaps the entire emotion is being forced. 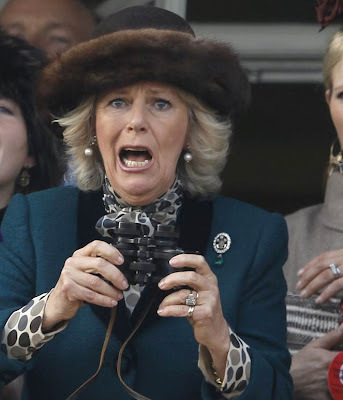 Another interesting characteristic of surprise - is that it is almost always followed rapidly by a different, second emotion - often this is anger, laughter, embarrassment and as Camilla has largely transitioned to here - that of fear. The Duchess of Cornwall has a bit of surprise remaining on her face - her eyes are opened wider than those of a normal, resting state. Eyes opened with this "white and wide" appearance, while there are some exceptions, are consistent with moderate-to-severe anger/rage, surprise or anger. Camilla's mouth is morphing from that of the dropped-jaw, mouth wide one of surprise - to that of the corners pulled back, one of fear. The Duchess of Cornwall is watching jockey Richard Johnson being thrown from his horse during the Queen Mother Championship Chase at the Cheltenham Festival Horse Racing Meet.